When setting up a poultry farm, housing is one of the most important factors to be considered. Deep litter system and battery cage system are the major types of housing for poultry birds. Battery cage system is commonly used due to some added advantages but I will show you how to use a deep litter system to maximize your profit better than battery cage system. What is a Deep Litter System? Deep litter system is an indigenous system of raising chickens whereby, chickens are raised on the floor covered with some specific types of material called beddings or litter materials to prevent the direct contact of the birds and the bare floor. This system of keeping poultry birds is, undoubtedly, the cheapest but requires some management practices most farmers find or let me say assume are not too important. If you have adopted the deep litter system and you could not get your desired result, I can tell you it is because of one or some of the below reason. Poor handling of feeder and drinkers. Have you seen some or all the mistakes poultry farmers make in deep litter system? Only if the aforementioned mistakes poultry farmers make under deep litter could be corrected, deep litter system would have been the best medium or system for raising chickens. Irrespective of your purpose of production, be it egg or meat production, you can raise chickens successfully in a deep litter system if you follow these guides keenly. This is very essential to the success of your birds in a deep litter system; most poultry farmers do not know that the nutrient requirements of chickens in a deep litter system is different from that of chicken kept in battery cages. Chickens eat to meet their energy requirement; energy requirement is always the reference point when formulating poultry feeds, either with feed formulation software or manually. Chickens in deep litter system need more energy in their diet compared to chickens in battery cages; this is because they use up more energy for perching, running, scattering and scratching the ground. Birds in battery cage do not have the privilege to carry out these forms of activities, hence, they conserve more energy. When formulating a diet for your birds in deep litter, try to increase the energy level of the diet to enable the birds to perform optimally. If you do not have biosecurity measures in your poultry farm, you are taking a huge risk. Remember, you birds have direct contact with the bedding and anyone visiting your farm, without restrictions, lands on the beddings. This is very detrimental to the health of your birds. You should restrict movements within your farm; do not allow anyone to wear any footwear to your farm. Have designated footwear, if possible, an overall, for use in an individual pen alone. Avoid direct contact with the birds; use gloves and dispose mortalities properly by burying and not throwing on the dumping site or pits as it is commonly done. Install foot and hand bathtubs at the entrance of individual pen, paste instructional aids on walls to guide the movement of visitors; these are different biosecurity measures to adopt in your farm. Using best bedding but poorly managed is more or less like a waste of time and resources. What the bedding material does is to take up the solid and liquid waste of the chickens to ensure the pen is dry at all time. This function makes the proper management of the bedding material very crucial. A poorly managed litter can harbor disease pathogen that can cause infection or death in severe cases. Beddings are supposed to be replaced weekly to make your pen clean always. 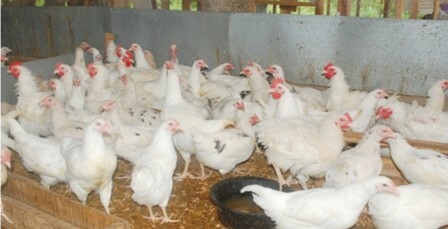 The principal cause of failure in poultry farm is poor management of the bedding material. Examples of bedding materials are sawdust, wood shavings, groundnut husk, rice bran, etc. ; the most commonly used bedding materials are sawdust and wood shaving. Considering the above characteristic of bedding material, wood shaving has been found to be the most suitable bedding material for chickens, especially in deep litter system. Sawdust is also good but it is suitable for birds kept in battery cage system where the birds do not have access to the ground. One of the disadvantages of using sawdust is its small particle size that can cause blindness or respiratory disorder in chickens. So, if you want to raise your chickens in a deep litter system, I recommend you use wood shavings as your litter or bedding material. Unlike the battery cage system, where an individual bird has its own compartment or feeding space, birds in the deep litter can make a choice of the drinker or feeder that drink and eat from. This feature makes it imperative to have as many feeders and drinker as possible when raising birds on deep litter system. Save your birds the stress of hustling to drink and feed by providing enough feeders and drinker to allow each bird eats and drinks conveniently. Aside from alleviating stress induced during feeding and eating, you have to ensure the feeders and drinker are clean before serving feed and water. Remove dirt and excreta from the linings and edges of the feeders and drinkers. Hanging feeders and drinkers are best for deep litter chickens; these feeding and drinking equipment should be up to the level of their breast. The fact that birds are kept indiscriminately in a deep litter system makes it imperative to be very stringent with disease management. Truth be told, diseases can spread easily in a deep litter system compared to battery cage system, however, with proper monitoring and observation, you can always control identify disease conditions and control before it escalates as much as possible. Ordinarily, as a poultry farmer, you must be very watchful, irrespective of the system of rearing you adopt. Observe the condition of your birds before closing for the day; similarly, at the beginning of the following day, do the same. Cull or separate the weak ones or any bird exhibiting a symptom of disease or sign of illness. After this, change your bedding material immediately. Snake, termites, rodents are the major pests you are likely to encounter in a deep litter system. Keep your farm environment free from bushes and weeds; they harbor pests, especially snakes. Surround the base of your pen with used engine oil, usually black in color; it repels termites from getting into the pen; block all holes and crevices. Birds have enough exercise to keep them healthy. Chickens exhibit their natural behaviors which are very essential for a good yield. Bone disorders, usually associated with battery cage, is completely eliminated. To cap it all, deep liter system requires low capital investment and it is highly recommended for raising broiler chickens; it reduces the tendency of fat accumulation and eliminates the problems of bone disorders. Someone on your timeline needs this information, remember to Share!